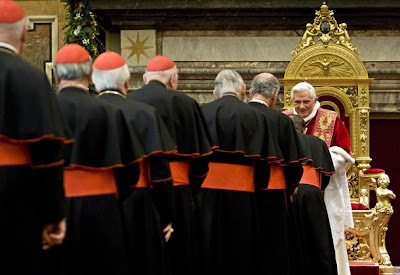 Whispers in the Loggia: Pope: "I'm No Rock Star"
This morning, B16 received the Roman Curia for the traditional exchange of Christmas greetings. While recent years have seen the pontiff's customary address take the form of a travelogue and recap of the year's activities, it's worth recalling that, in 2005, the first of Papa Ratzi's Yuletide talks became one of his reign's landmark texts, often referred to in shorthand by its signal phrase: the "hermenutic of continuity." This time around, the lengthy review's lead buzz-passage came in a papal analysis of World Youth Day, as Benedict reflected on this year's edition of the triennial gathering, held in Sydney in mid-July. "The uniquness of the [World Youth] days and the particular character of their joy, their creative force of communion, can find no explanation. Above all it's important to take into account the fact that the World Youth Days do not consist solely in just the one week where they're publicly rendered visible to the world. It is a long road, interior and exterior, that leads to them. The Cross, accompanied by the image of the Mother of the Lord, makes a pilgrimage across countries. Faith, in its way, needs to see and touch. The encounter with the cross, which comes to be touched and carried, becomes an internal encounter with the One who took up the cross and died for us. The encounter with the Cross sustains in the soul of the young the memory of that God who wanted to make himself man and suffer alongside us. And we see the woman given us as our Mother. The solemn Days are but the culmination of a long road, along which we find one another and go together to encounter Christ. Not just in Australia did the long Via Crucis cross the city and become the culminating event of these days. It likewise reflected again all that happened in the years preceding it and pointed to Him who reunites together all of us: that God who so loved us even to the Cross. So, too, the Pope is not the star around which it all unfolds. He is totally and merely the Vicar. He returns to the Other who is in our midst. Finally the solemn liturgy is the center of this togetherness, for in it comes that which we cannot realize and which, still, we are always awaiting. He is present. He enters among us. The heavens are torn and the earth is made luminous. It's this that renders life light and open and unites the many ones with others in a joy that is incomparable with the ecstasy of a rock festival. Frederich Nietzsche once said: "The ability is not in organizing a party, but in finding the people able to bring it joy." According to Scripture, joy is the fruit of the Holy Spirit (cf Gal 5:22): this fruit was abundantly perceivable in the days of Sydney. And just as a long road precedes the World Youth Days, a path following it is likewise drawn. Friendships are formed that encourage a different lifestyle and that sustain it from inside. The great days have, not an ending, but the scope of sustaining these friendships and of making places of life in the faith rise in the world where, together, hope and love can be seen. During WYD Sydney, a leader of the Aussie branch of the Society of St Pius X -- the schismatic traditionalist group -- knocked the weeklong event as a "happy party" with "very little that is truly holy and sacred and prayerful" in it.